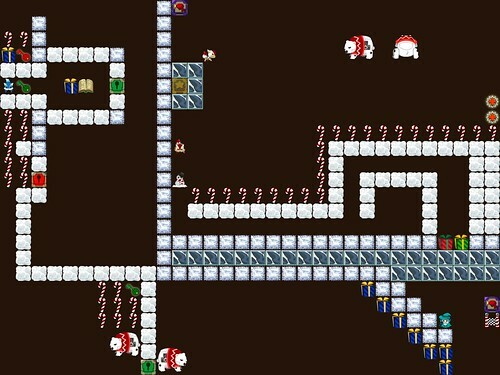 My 8 year son and I created this video game over the weekend, working a holiday/winter theme into a game experience. I’m sharing it here but also, I am creating a game challenge for my students to see who can created the most inventive holiday-themed video game (with my son, as the judge). Today, many teacher bloggers are going silent as a way to honor the memories of those lost in Friday’s tragedy. I am joining them. I did a book review over at Middleweb of the collection — The Connected Teacher: Powering Up— and enjoyed the insights of the teachers writing about their experiences with technology and learning and collaborations. In particular, I found Byrne really shifting my thinking about the ways that technology has altered our relationship with music. Here’s something that I never really considered but now seems obvious: when the ability to record music and share music first began, the way that music was constructed and composed changed to the meet the constraints of the recording aperatus. For example, music on a vinyl disc (remember those?) was limited to a set amount of time, or else your ran out of space. So, songwriters and composers began to write pieces that fit the time allowed on a disc. And listeners began to get accustomed to the set time frame, too, and from that emerged the three minute pop song. The ways that music was recorded impacted the writing of songs, too. Early microphones were set up in a room, and the band crowded around it, moving closer and farther away, depending on when your part needed to be heard. But bass tones were difficult to hear, and so the sonic construction of the music began to become part of the songwriter’s tools. And this is not just pop music. This was jazz and classical, too. The technology was changing our perceptions of what we thought we were hearing, and composers began realizing the limitations and the possibilities of the technology to revamp the way that songs were composed, performed, and heard. Byrne also goes into the way a social space (in this case, CBGB’s and New York City) can influence the creation of art, and about the business of music, which is interesting in these times when that entire business model is complete flux, and he describes his songwriting techniques of constructing songs from the sounds first, lyrics later, and aiming to use unconscious thought patterns as the springboard for a song. I found it interesting because I have done the same thing with songwriting. I just never thought of it through the same lens as Byrne. Which brings me to the connections with all kinds of writing. One of the things that I remain fascinated with is the ways that digital tools and technology may or may not be shaping the ways we write, and what we write. How do the constraints of the tools inform our choices about the meaning of what we write? How are we taking expectations of technology and pushing at its borders in order to reconsider our traditional definitions of writing? In many ways, Byrne is exploring similar terrain, just with music. This is a smart, insightful book that forces you to move beyond music, and into the larger conversation about composition. Like many of you, I heard about the Sandy Hook shooting in the midst of the school day. We refrained from mentioning it our sixth grade students, both out of uncertainty of the situation and appropriateness of who should be framing such news. But we heard about it from a young substitute teacher who got a text message from a student at the high school. My first thought: my 12 and 14 year sons are at their schools, and they probably already know about it, and I am not there to help them process it. The news apparently spread like wildfire through their middle and high schools, thanks to the proliferation of mobile devices and word of mouth and the constant flow of news in the information age. I may be an advocate for technology, and I may talk a lot here and in other places about the power of digital media, but there are times — like this — when I wish there was a huge switch we could yank on to slow things down and give us — individuals, families, schools — time to mourn thoughtfully. Just to stop the deluge for a bit. Listening to the radio news on my ride to get my oldest son from basketball practice after school on Friday, I was in tears. I could not shake the vision of the terror of the situation, and the sadness that must be consuming the families and the community. I picked up my older son, and then my 12-year-old son, and we talked a bit about what happened, about the madness of the situation. Not much. Just enough for them to know I was there, and they were safe, or at least, as safe as they could be. And that we could talk, if they needed. “But don’t talk about it with your brother,” I warned. My eight year old son was at home, blissfully unaware of the news. He’s far from plugged in, and yet, my wife and I knew that come Monday (or maybe sooner), the news of Sandy Hook would filter to him, and he would learn about it, and what he would hear would be filtered through the minds of other 8 year olds. In other words, it would be news from sources that could not be trusted for accuracy. We hid the newspaper yesterday, burying the headlines in our bin of paper. Out of sight. But still, he needed to know. I struggled yesterday with how to broach it with him. I asked around on Twitter. I read some articles that gave advice, thought long and hard, and then, as he and I were sitting on the living room floor making Lego ships during the afternoon, I gently explained that he would probably hear people talking about a terrible tragedy, that some children in a school were dead, and I wanted him to know about it. I gave very general information, nothing specific, and emphasized our need to say prayers and send good thoughts for the families, and keep those kids in our hearts. Here was the topic what I was hoping to avoid, but I both acknowledged that guns were involved, and then I deftly dodged/weaved around the specifics. I brought our discussion to a close with another reminder about prayer and thoughts for the world undone by tragedy. He looked at me closely, seriously, and asked if our church pastor had heard the news. I said, he probably has, and that he would likely ask the congregation to pray for Sandy Hook families. My son nodded, thoughtfully, and got back to making his Lego ship. We worked in silence on our Legos, both of us deep in thought. It was the best I could do. 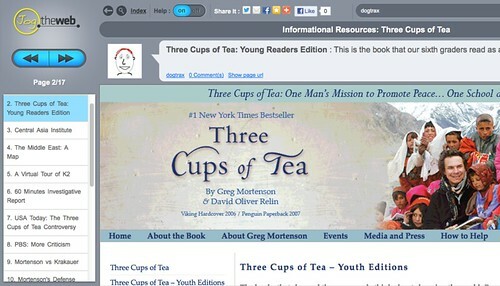 In an effort to bring all of my informational resources that I used with my sixth graders as we did a close and critical reading of Three Cups of Tea, I decided to use Jog the Web to collect and curate in sequence what we were doing. You’ll notice that it spans the range of the book itself, to the 60 Minutes investigative report, to Greg Mortenson’s tepid response to Outside Magazine, to exploration of girls’ education in Pakistan and more. I even added some student reflections on the idea of truth in storytelling. Yesterday, I had my sixth graders blogging about the “story frames” of the science-based video games they are developing. 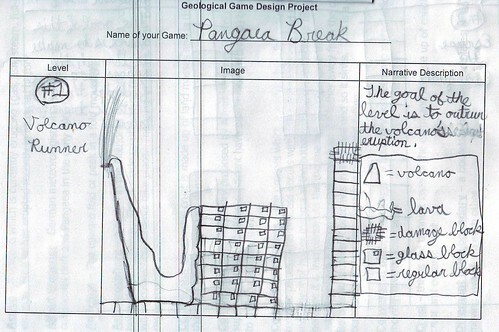 I’ve been pushing the narrative element as a way to keep their games coherent and focused, even as they work the concept of geology into their games. 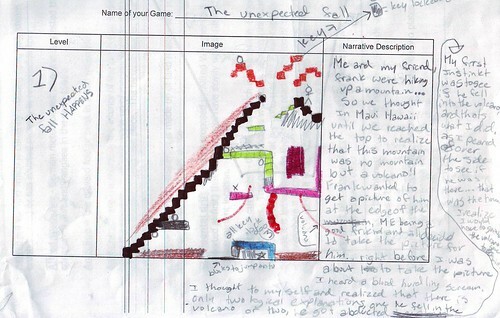 Each day, I have tried to make the metaphorical connection for them – that their video game is really a short story, and that the player is really the reader, and how as writers/designers, they are bringing someone else into their story. 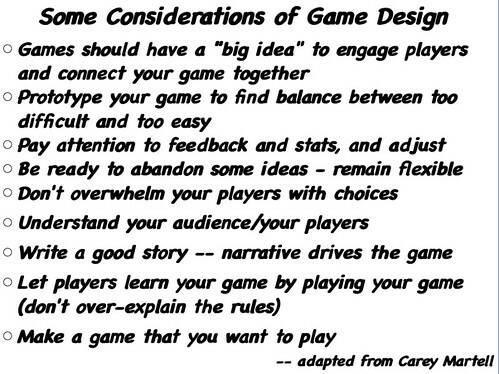 I’m looking forward to the emergence of these stories as games … and games as stories. Some people learn by diving in. Some people learn by reading the manual. 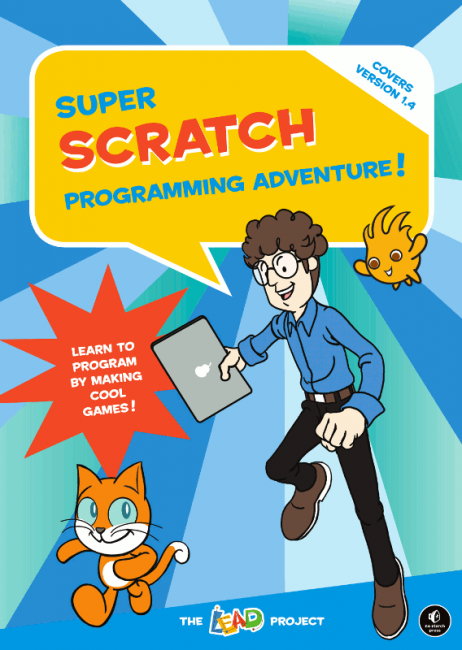 Super Scratch Programming Adventure is a little bit of both as it is both a graphic novel of sorts and a tutorial for Scratch animation software. It’s also a bit dated, as a newer version of MIT’s free Scratch software is already out. But I like the way this book sets out to engage learners with a little bit of story told as comics and graphic novels, and then a series of ever-increasing-in-complexity activities. Everything from simple commands, to maze games, to more complex animation is covered in this graphic manual. The colorful visuals are key, as the reader/creator can follow along pretty easily enough with the tutorials. 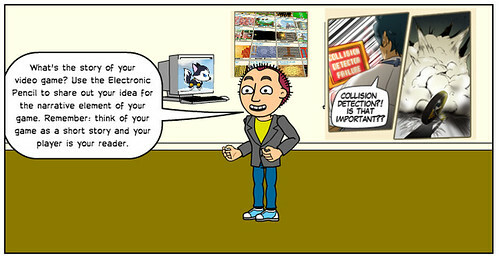 I’ve used Scratch a little as a way to show students the underpinning of programming. I never found it robust enough or easy enough for many kids to use regularly. But the visual element of how programming works – how systems work, really, as one piece influences another — makes Scratch worthy of consideration for basic animation and programming work. 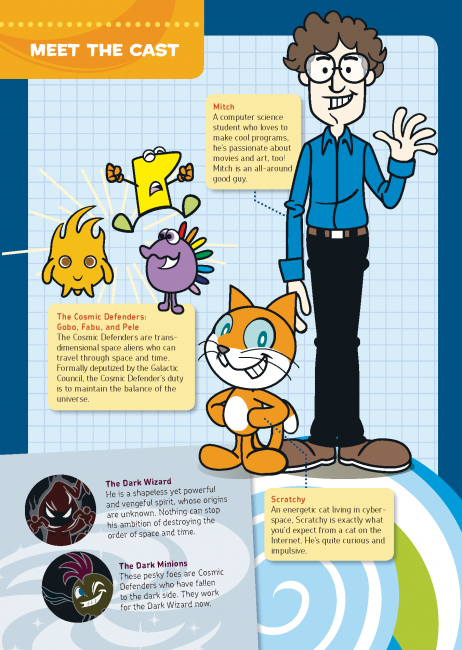 The graphic story that weaves together the tutorials is a computer science student named Mitch who encounters Scratchy, a cyberspace cat, and a team of Cosmic Defenders — Gobo, Fabu and Pete — who help Mitch and Scratchy solve problems while holding off the Dark Wizard and Dark Minions who want to destroy space and time. Programming skills save the day! This book is worth a look if you are venturing into Scratch, but keep in mind the updates to Scratch, so not every activity might still be replicable as represented in the book. Still, there are plenty of tutorials online and resources for using Scratch in the classroom, including the ScratchEd site. I am lucky to be doing reviews of educational books for MiddleWeb, and the latest is a look at Get It Done, by Jeff Wilhelm, Michael Smith and James Fredericksen. The book dives into expository writing and strategies in a way that connects nicely to the new emphasis on these texts in the Common Core. I created the chart above as a way to think through some of the strategies that the book suggests, particularly around flowchart thinking and making lists. 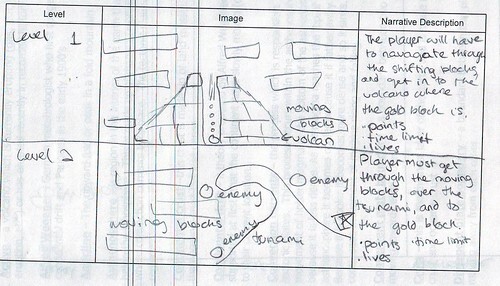 And here are a few of the storyboards, which they do as a draft stage of game design to get main ideas down. I like how it shows some visual thinking and provides me with a talking point with students about their concepts and ideas.